Next in the series on Jenny's Jerky is this Spicy variety. See my previous review of their Original. Jenny's Jerky is owned by CorLa Foods based out of Alameda, CA. It was started by Jenny Ma, who with her family would make frequent trips from San Francisco to Los Angeles down the coast, stopping at shops and stores and picking up bags of jerky to much on. But not finding anything that really knocked her out, Jenny decided to try her hand at making her own jerky. So after a few years of experimenting with various recipes, Jenny's Jerky was born. 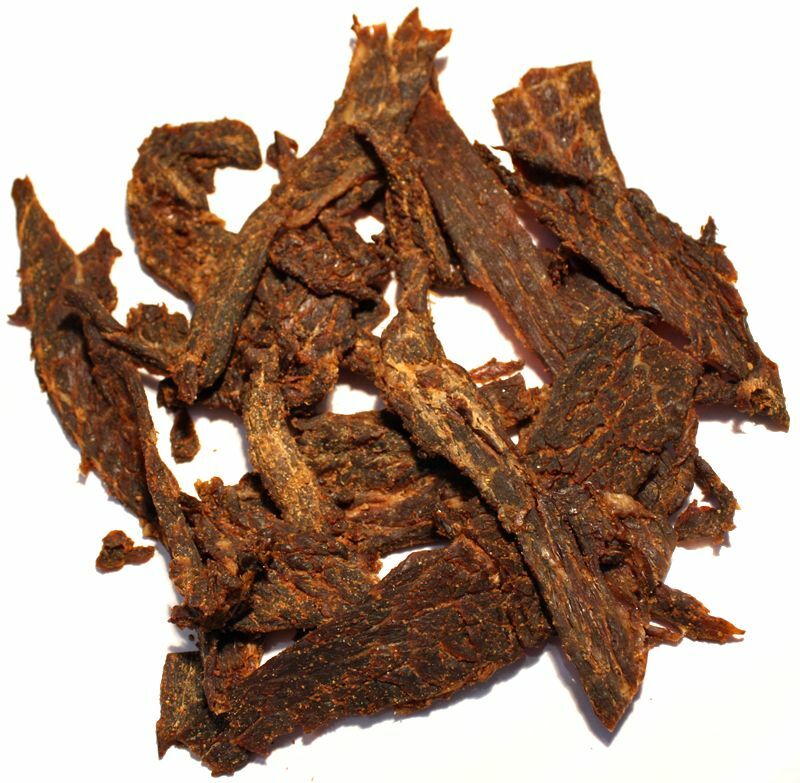 This Spicy variety is described by the company as being the "Hot Mama", and "not your average spicy jerky", offering a chile pepper flavor in addition to a burn. Beef, soy sauce, Yoshida Sauce, Worcestershire Sauce, brown sugar, black pepper, red chile pepper, garlic powder, Tabasco Sauce, liquid smoke flavoring. The first thing I taste from the surface of these pieces is a chile pepper flavor, and a good deal of burn. There's a spicy, peppery sauce flavor that hits right away too, perhaps the Tabasco. There's also a strong saltiness, and a light bit of the smoke flavor. 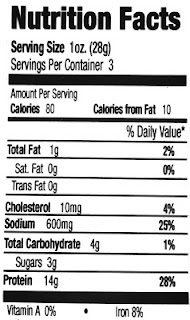 The chewing flavor introduces some light natural meat flavors, but otherwise continues on with the surface flavors. For being labeled as "Spicy", this certainly does live up to that description both in terms of flavor and heat. It has a high flavor intensity starting with a well-noticed chile pepper flavor, and what tastes like traces of the Tabasco Sauce. The combination of worcestershire, Yoshida, and soy sauces seems to increase that intensity. As far as the heat goes, this has lots of heat, what I would rank on my heat scale as being "hot" (level 5 out of 5). It's still not the hottest jerky I've ever had, but definitely right up there with the best of them. I can feel that rush going through my body, my eyes are misting, my scalp is sweating, and I'm getting a bit of a runny nose. And the flavor that seems to dominate this jerky the most is the chile pepper flavor, which seems to be enhanced by the Tabasco Sauce. The natural meat flavors are light, but seem to be the next most noticeable flavor. I can pick up traces of the soy sauce and Yoshida sauce, along with touches of sweet, as I continue on with the chewing. The level of saltiness in this feels high. 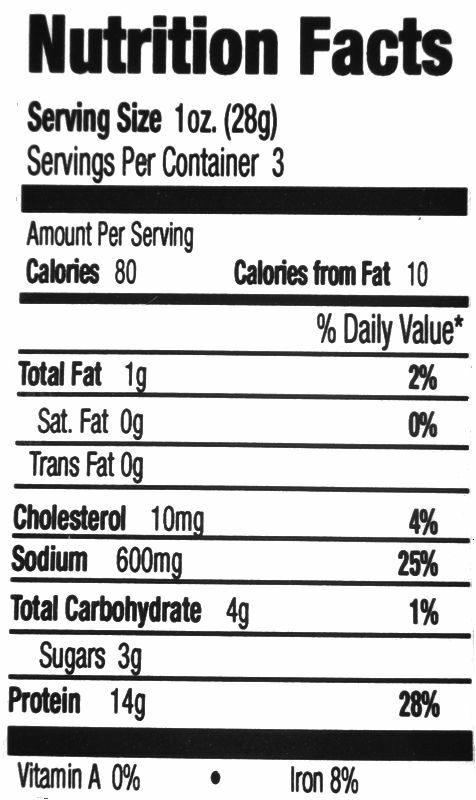 At 600mg of sodium per ounce, that's on the upper end, but still not that high. I believe the high level of heat is making it feel more salty than it really is. Overall, what you're going to notice in this is largely a chile pepper flavor stemming from the red chile pepper seasoning and Tasbasco Sauce, along with a high level of heat. But you'll get a light natural meat flavor, and traces of soy sauce and Yoshida sauce, along with a high level of saltiness. These are slices of whole meat, sliced into strips of medium thickness, and in length ranging from three to six inches. 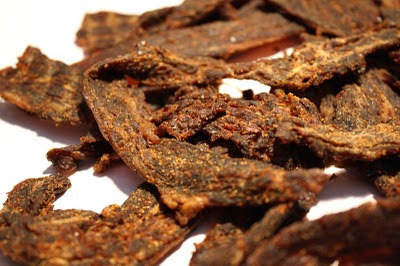 This is a dry jerky with dry surface feel, but with a lot of flexibility. Biting off pieces seems to be easy, while chewing ranges from easy to moderate. The chewing texture starts out feeling pliable and somewhat soft, with a light to moderate initial chewing resistance. It seems to break down without much effort, and once down to a soft mass, it has a rather mushy, but still somewhat steak-like chewing. Several of these pieces have small bits and streaks of fat in them, and they seem to add a fatty flavor too. I found a fair amount of stringiness, and some occasional unchewable tissues. In terms of clean eating, my fingers don't pick up any residue, and I get just a light amount of seasoning falling off these pieces as I bite chunks off. 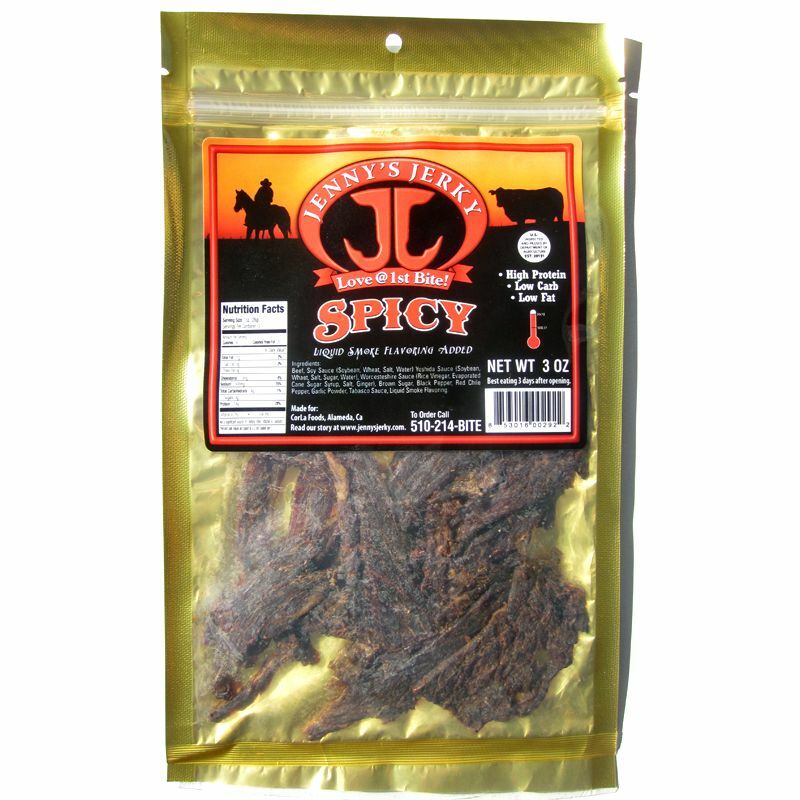 Jenny's Jerky sells this Spicy variety from its website at a price of $5.99 per 3oz package. If you bought five packages, the shipping to Southern California is $11.95, for a total of $41.90. That works out to a price of $2.79 per ounce. For general jerky snacking purposes, at the $2.79 per ounce price, this seems to provide a good value. I get a great deal of snackability for an overall great flavor, decent meat consistency and and average chewing texture. That price is considerably higher than you'd pay for major brands of jerky at a grocery store, but seems to generate a lot of snackability me. As a Spicy jerky, at the same $2.79 per ounce price, it's also a good value. I'm getting a lot of spiciness, both in terms of heat and flavor intensity, much more than what I would normally expect from a jerky labeled "Spicy". 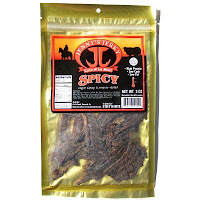 This Spicy variety from Jenny's Jerky delivered a nice one-two punch of spiciness for me with its strong chile pepper flavor, and a strong level of burn. But it manages to boost that with a noticeable Tabasco Sauce, and hints of the soy sauce and Yoshida Sauce. There's touches of sweet, and a lightly noticeable smoke flavor too. Overall, there's a lot of flavor packed into each bite, and despite the sensory overload, it still manages to provide a light natural meat flavor. And it's seems quite easy to eat, though a bit mushy in the chewing texture, but still very meat-like. For those who love jerky with a lot of heat, this seems to fit the bill. My recommended beer pairing, go with a smoky porter, like the Stone Smoked Porter, or the Anchor Porter. I think the dark roasted malt and light sweetness will pair well with the flavor intensity of this jerky.